Overview At the tip of the Kenai Peninsula lies Kenai Fjords where glaciers, earthquakes, and heavy ocean storms are changing the landscape in bigger ways than most other places on the planet. Wierd animals like Ice worms live here along with massive bears and the Earths biggest mammals: whales. Native Alutiiq use everything here to live a life hooked to the sea. Picture shows Moose cow and two calves on Exit Glacier's waters. The moose is the largest of the deer family and they can be very dangerous when with calves. 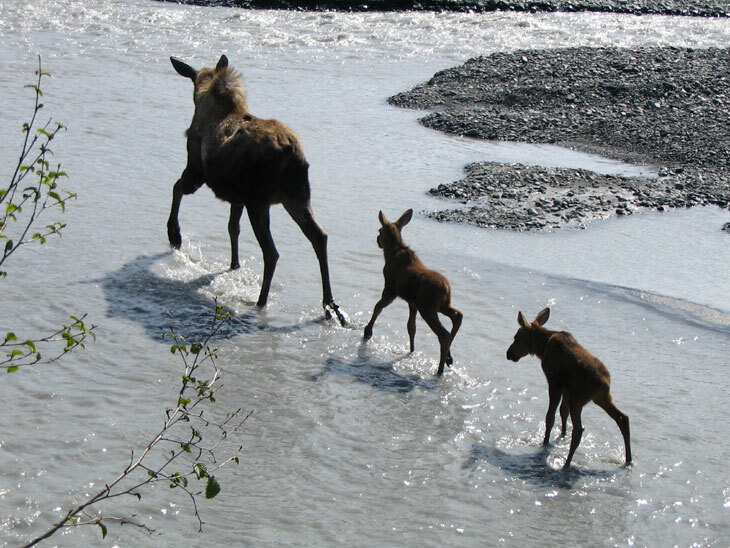 Moose gives birth to twins nearly 90 percent of the time so this is not an uncommon site. The are usually born in May or June. Outdoor Activities include camping, hiking, trail running, flat trips, fishing, limited hunting and trapping, plus star gazing, p hotogprahy and filming the great outdoors. This is a dynamic ecosystem that is in constatnt change maning no two trips will be the same. many come here to follow the habits of the Parks diverse wildlife. Did you know the beautiful white mountain goats give birth right by the sea? Huge massive bald eagles fly everywhere here and are as common as seagulls in Florida. Black bears can get pretty scary here too. Elk have been seen and Grizzlies reported but not confirmed. Picture shows tidewater glaciers flow into the ocean along Kenai Fjords coastline. Kayaking with a guide is strongly recommended for most boaters due to the extreme conditions here and penalites for error go way up in Alaska. 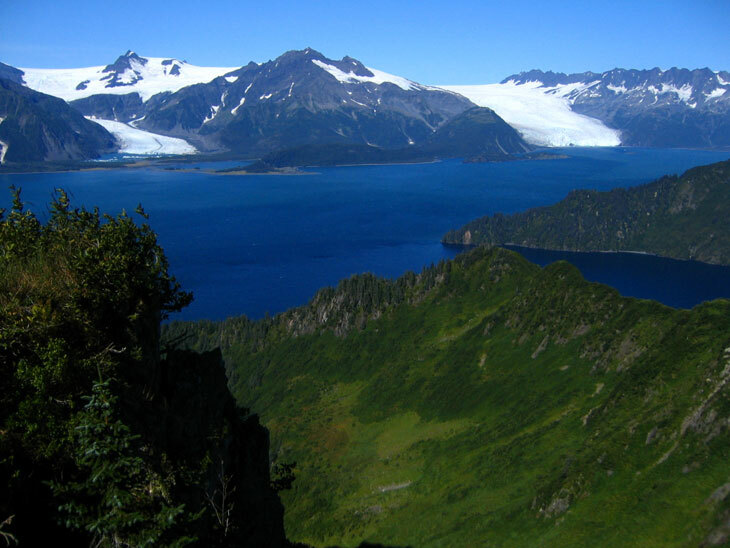 The Kenai Fjords are exposed to the entire Gulf of Alaska which means there are not many calm water inlets. These is not white water for beginners! Almost all landings will involve surf, and my wife and I have capcised riding in 3 times in our lives and never wnat to repeat that. Rainfall is often excessive with year round storms creating swells of 3 feet or more which push way up into this part of the inner waters of Alaska. Most kayakers get here using a water taxi or charter a boat out of Seward. They usually choose to get dropped off in Aialik Bay or Northwestern Lagoon as these two are quite scenic. You can also fly to the Nuka Bay area from Homer if you want more privacy. You can paddle from Seward in Resurrection Bay or overnight to Caines Head or Bear Glacier. Most guides will tell you that rounding Aialik Cape using any kind of kayak is dangerous. The long stretches of very exposed coastline combined with absolutely no landing spots from Callisto Head to Aialik Cape plus cold water make this extremely treacherous. Picture shows the Holgate Glacier calving in Aialik Bay in the Kenai Fjords National Park Alaska. Hiking - The 7+ mile round trip Harding Icefield Trail is a spectacular day hike and highly recommendd with good shoes. Begin in valley and hike up into the heavy cottonwood and alder forests. You will pass heather and wild flower filled meadows wth lots of birds and wildlife. Eventually you make it to the breath-taking Icefield view. The top of the trail shows you what massive ice can really look like in unspoiled wildernesss. Here the ice and snow stretch as far as you can see. This trail is strenuous because it goes up about for each mile. There are rocky sections in the first mile that may require a bit of scrambling but they are not too bad. It will take you 6-8 hours for the hike if you want ot really enjoy yourself but be preapred for an accident. The view from the top is well it, but you don't have to go all the way to the top to see alot. Even a 2 hour hike up the trail allows views of the valley floor and Exit Glacier. 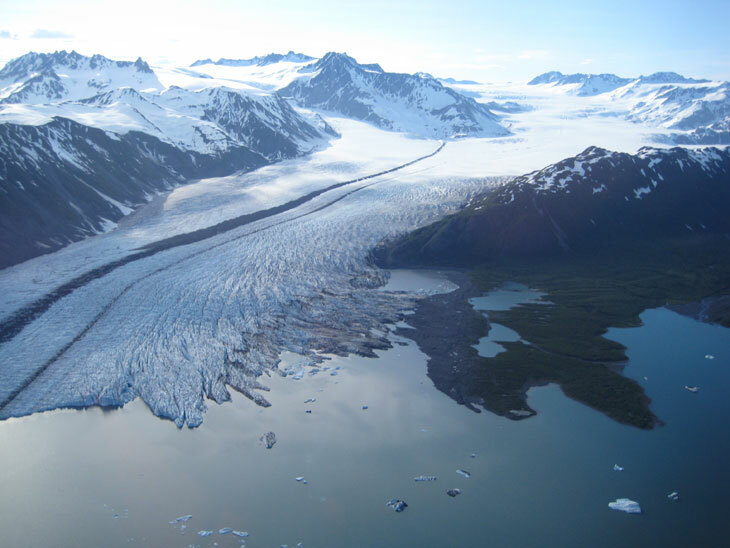 Picture shows Bear Glacier which is the largest glacier in the Kenai Fjords National Park. Boat Tours - Boat tours depart Sewards small boat harbor daily in the summer months.Make reservations in advance as it can get crowded. 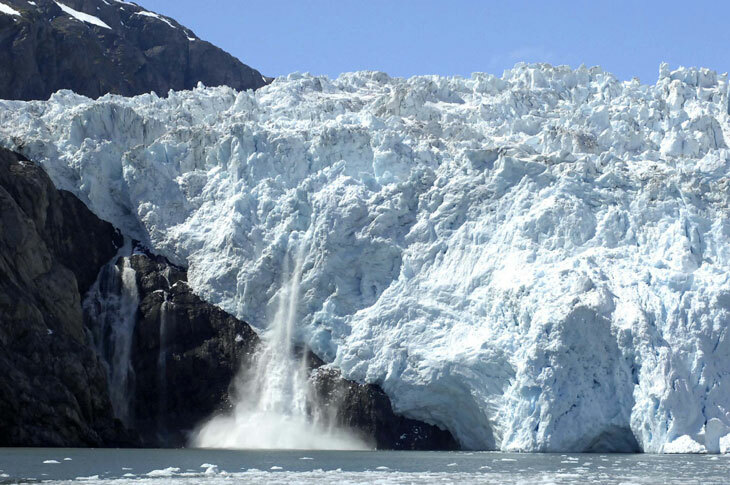 Full-day tours that go to the parks tidewater glaciers are available. You can also take a half-day tour if you don't mind staying in the calmer waters of Resurrection Bay. You will see wildlife and sea life either way. Picture shows a Stellar Sea Lion resting. Kenai Fjords National Park south side on No Name Island has the best view of Steller sea lions. Al around Cape Aialik you can see sea lions on the cape rocks. 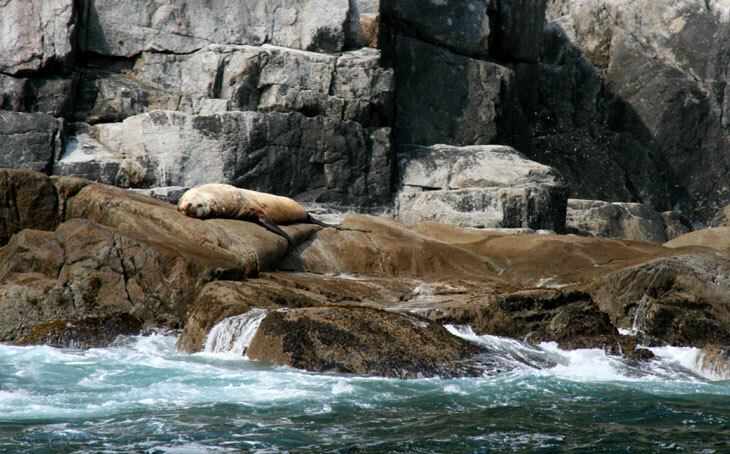 The sloping rock at the southwest arm of Cecils Place is a favorite sea lion haul-out as well. Chiswell Island is the only true sea lion rookery within 100's of miles that I know of. Vanabode Special Notes: Even though Alaska can be extraordinary and Vanabode offers the absolute safest, easiest, cheapest, and fastest way to get there from the states outside of a straight flight in, I still cannot recommend it. Alaska is rugged and wild and the inclement weather can be devastating. If you do travel during the very warmest months please do some heavy research and planning so that your van is outfitted for Alaska's extreme temperature swings, rain and bugs in Kenai Fjords National Park, Alaska.